largely comprised of hotels, needed to quickly find a way to generate positive top-of-mind awareness for Montreal in order to stimulate hotel reservations. To reach this objective, the best option was undoubtedly to target low hanging fruit: Montréal’s close neighbour Québec City, whose inhabitants are within an easy driving distance and not afraid of a winter commute. The strategy seemed like the best way to effectively increase Tourisme Montréal's performance during winter's low season, but there was one small problem: most Québec City residents don't really like Montréal. In fact, many of them have a grudge against the metropolis and nourish a long-lasting love-hate relationship for the big city where traffic is an everlasting pain, construction sites and potholes are just part of the decor, attractions are located in busy streets and parking can never be found. Montréal’s neighbours don't really want to visit, because they think they know the city inside-out, having known it for so long. They love to hate it, but deep down, they know there was once love there. Just like an old flame, Québec City needed to be re-conquered and made to fall in love all over again. The idea was to declare Montréal's love for Québec City with a geo-targeted campaign where Montréal takes the form of a person who endeavours to win back the heart of their lover by claiming “I've changed.” With a touch of humour and love added in, the city proclaimed loud and clear that it had changed, flaunting all the new features and attractions developed for Montreal’s 375th anniversary. self-centered media ecosystem, including Tourisme Montréal's PR efforts: a box of surprises destined for Québec City's leading journalists. While a decrease in hotel bookings was expected for the first quarter of 2018, the campaign accounted for an increase of over 4%. 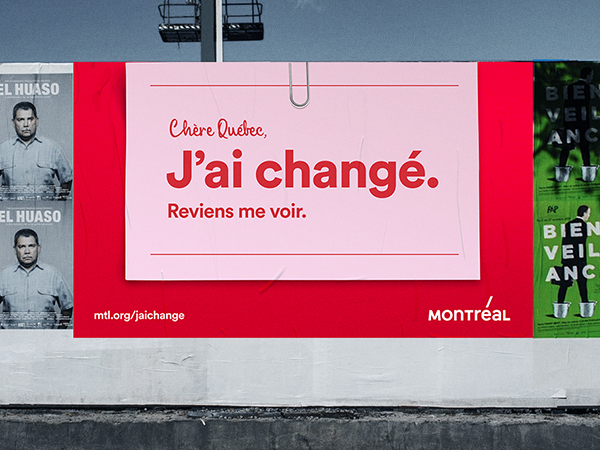 With more than 4 million impressions, over 1 million video views, billboards all over the city and more than 100,000 personalized messages in Québec City homes, the campaign became the talk of the town and doubled its value thanks to positive press coverage. It created a reputation gain worth over $340,000, to contribute to a 74% increase for the first quarter of the season. It generated 138 articles in the press, including top-tier media like CBC/Radio Canada, La Presse, Le Soleil, TVA and Le Journal de Montréal, and contributed to a 34% increase in visits to the destination website. Quebéc City heard the message loud and clear and answered the call... literally. Quebéc City Tourism even posted a witty response on social media, saying it was waiting halfway between Montréal and Québec City. Almost like jealous suitors, other cities joined the movement, which allowed the campaign to gain more mileage across the province. Montréal was on everyone's lips during a key period. 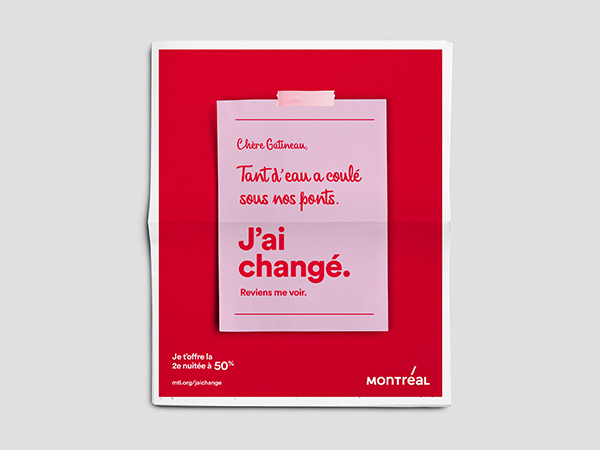 The campaign got people talking and moving... in Montréal’s direction.